Following the release of her 11th studio album, 40-year-old international superstar Shakira has announced that she is going on a world tour. On June 27, Tuesday, Shakira took to Instagram to announce plans for an "El Dorado World Tour." The tour, which will be sponsored by Rakuten, will feature many of her catalog hits. It will commence on Nov. 8 in Cologne, Germany at the Lanxess Arena. "Thank you all so much for listening to my music in so many places around the world," Shakira told E! News in a statement. "I can't wait to be onstage again singing along with all of you, all of your favorites and mine. It's going to be fun! The road to 'El Dorado' starts now!" the singer added. The tour will feature stops throughout Europe and North America including New York's Madison Square Garden and Paris' AccorHotels Arena. A Latin American leg of the tour will be announced at a later date. Tickets will go on-sale starting Friday, June 30, at 10:00 AM local time. 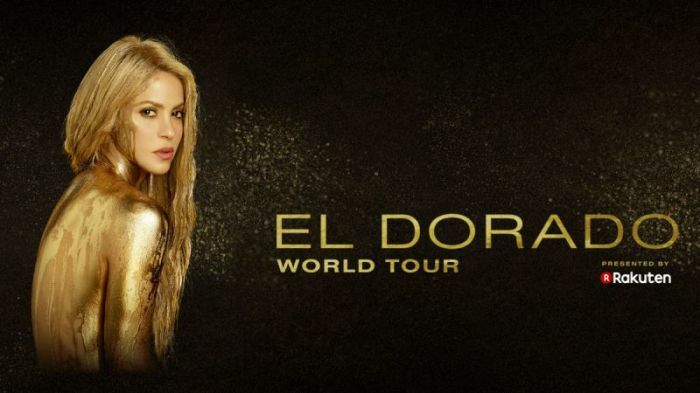 The "El Dorado World Tour" was named after her recent album that was released on May 26. While the 11th studio album was accompanied by minimal promotion, it is apparently doing well on the Billboard charts. The album's first single, "Chantaje," has topped Billboard's Hot Latin Songs chart for eleven non-consecutive weeks. It was even certified 16X platinum by the Recording Industry Association of America (RIAA) in the Latin field for exceeding sales of 960,000 copies. Inspired by her personal life and experiences, "El Dorado" primarily features songs about Shakira's relationship with her boyfriend, Gerard Piqué. "Finding inspiration itself and realizing it had always been there all along — that was my El Dorado," Shakira told The New York Times, adding, "That was a perfect state of mind."